A significant part of FoNAF’s efforts is the construction, repair, and maintenance of hundreds of miles of wire and log fences on both the Flagstaff Ranger District and the Mogollon Rim Ranger District. These fences are integral to the preservation of our natural resources. Below are three specific fence applications FoNAF builds and/or maintains at the request of the Forest Service. To contact the Fence Program Coordinator for more information click here. The Flagstaff Ranger District alone contains more than seventy fences, commonly termed “exclosures” that keep elk, deer, and livestock out. Their locations range from the Hochderffer Hills (just north of the San Francisco Peaks) to five miles south of Mormon Lake. There are approximately an equal number on the Mogollon Rim Ranger District. Experience has shown that these fences need to be seven and a half to eight feet high and maintained for 20-30 years. If they are removed any sooner or are allowed to deteriorate, the elk, deer and livestock can make short work of the young aspen or willows. These fences surround sensitive areas including springs, riparian areas and meadows to keep elk, deer, livestock and motorized vehicles out, allowing natural vegetation to flourish. The fences must be eight feet high to be effective against wildlife. Fences designed just to keep out motorized vehicles are typically a log-worm design and can be very attractive. FoNAF builds and maintains these types of fences on both districts. Many right-of-way and pasture fences were built using three, four or even five strands of barbed wire. 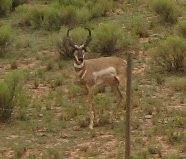 These present a challenge to pronghorn antelope that do not jump over fences but scoot under them. The Flagstaff Ranger District in a joint effort with Arizona Game and Fish Department convert these fences to be what is termed "pronghorn friendly.” That involves replacing the bottom strand of barbed wire with smooth wire, placing it at least eighteen inches above the ground. FoNAF is assisting in this effort. To provide consistent monitoring of the aspen and riparian exclosures on the Flagstaff Ranger District each structure is assigned to a steward – a FoNAF member who has volunteered for this duty. He or she visits the exclosures(s) for which he or she is responsible at least two times a year – early spring after the snows have melted and late fall before the snows arrive. If a steward observes minor damage he or she may make the needed repairs immediately. In the case of more severe problems, such as when a tree has fallen on the fence, the steward will report the problem to the fence project coordinator.